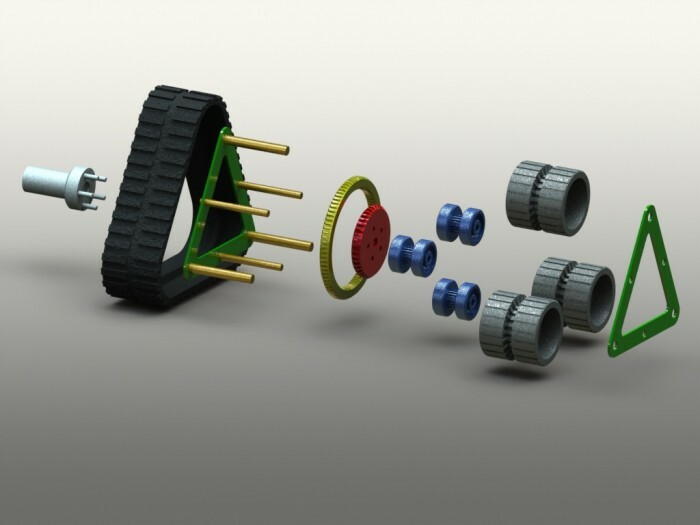 A track drive includes a primary driven gear configured to attach to a vehicle hub plate and an annular gear having gear teeth on in inner circumference and an outer circumference. 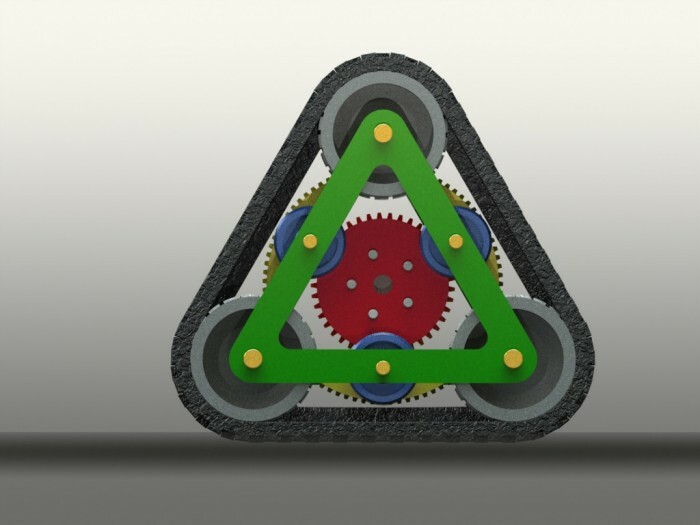 The track drive can also include a plurality of intermediate gears disposed between the primary driven gear and the inner circumference of the annular gear, and a plurality of track drive wheels having an integrated gear configured to mate with gear teeth on the outer circumference of the annular gear. The track drive can further include a continuous track configured to be driven by the plurality of track drive wheels. This design is a further development of the Hurricane: it allows rotation of the entire track mechanism. The TRIO track set: Outlast long winter conditions with the Trio track set semi-permanent attachments to your vehicle. Fixed to the wheel hubs in place of your normal wheels, the Trio track set converts your car, small truck or SUV into a go-anywhere track-laying vehicle. Once fitted, there is no need to change again until weather or terrain conditions return to normal. Ingenious multiple gearing allows accurate rotation of the entire track and thus presents the maximum footprint to the vehicle-to-ground interface. The Trio track set is cost-effective, replaces your road wheels when road conditions are dire and can be removed easily and stored for later use. 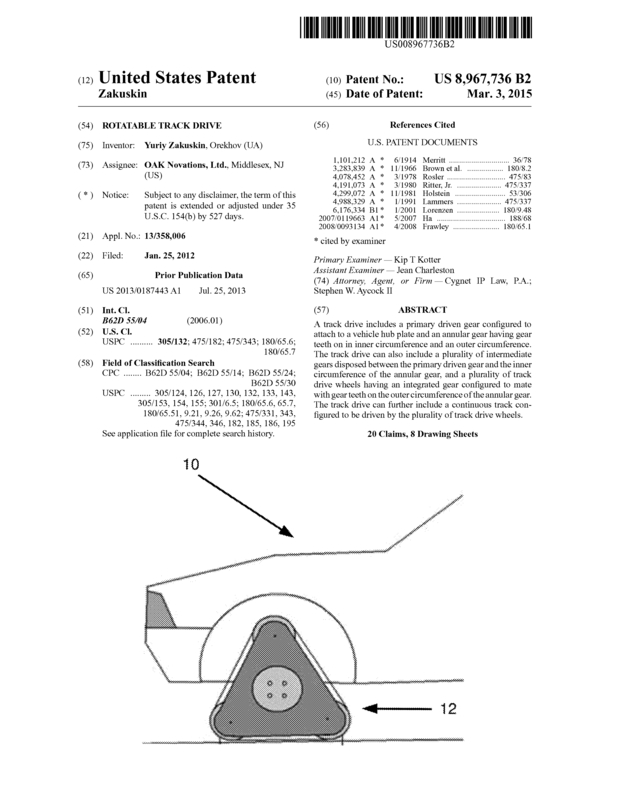 Page created at 2019-04-25 18:01:15, Patent Auction Time.